The exhibition Edge of the World bears testament to Anna Berezoskaya’s journey as an artist and highlights her signature style of poetic realism. It is on at REDSEA Gallery from May 15th to June 14th, 2015, where works are open for acquisition. 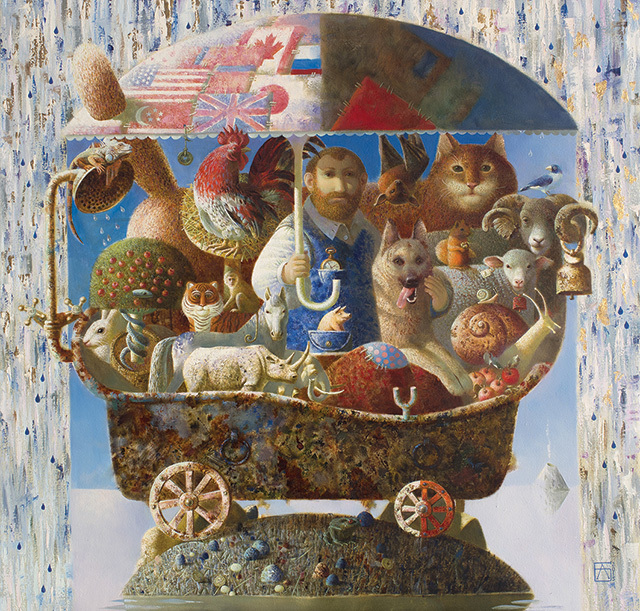 In her newest exhibition, Berezovskaya has developed and honed her signature style – poetic realism, with which she brings together techniques unique to abstract art and Surrealism, and her emotions and inspiration. She uses symbolism to create timeless works on canvas and paper, carefully selecting subjects that transcend time and space to convey her ideas and emotions. In doing so, she is inspired by Russian culture and literature. For example, locks and keys feature prominently in her works, representing mysteries to be unlocked and discoveries to be made. The recurrence of safety pins in her work hark back to an old Russian superstition which claims that wearing an old safety pin will ward off evil. Snails also feature prominently as the spiral on the shell of a snail is a symbol of life. Bringing these symbols together, Berezovskaya depicts a world of her own, full of its own meaning and stories. However, her works do not necessarily only convey Russian culture, although symbolisms from the culture are often appropriated. What she portrays are universal themes but within a Russian context. 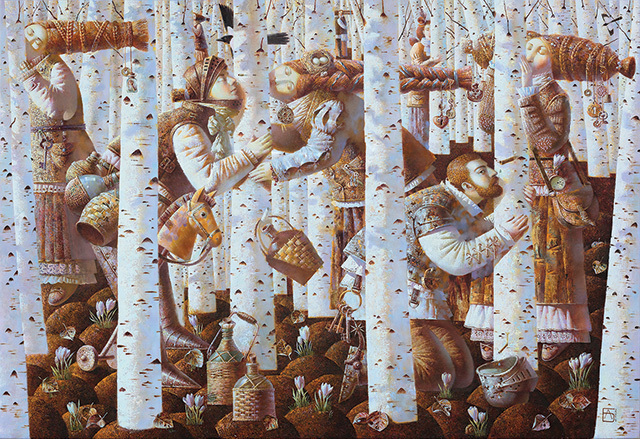 In the example of her latest work, Kissing the Birch, the story is about love, a universal theme but given a Russian context with her use of the birch trees. In Edge of the World, the world she creates is one, which is unfamiliar but yet resonates with the viewer through the fleeting moments of beauty, joy and playfulness in everyday life, which she captures. Bringing together humour and optimism through romantic narratives, Edge of the World is an invitation to a world of enchantment and gaiety. The series pivots on the sense of emotions that people go through as well as values that they hold close. While each work in the series is a separate and distinctive piece, the common thread that binds them is the strong emotions and feelings that Berezovskaya has imbued in each one. “I still draw on stories that I love from my childhood but in terms of development I realise I have developed and grown and my ideas are becoming more interesting, sharper, more developed. With my new series Edge of the World I wanted to invest the works with a sense of what people value, what is worth doing. I have done this using the style and techniques I have always used, but perhaps with a stronger sense of symbolism and a greater awareness of my own artistic style,” says Anna Berezovskaya about her latest series. 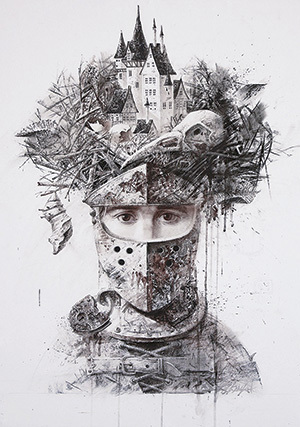 Anna Berezovskaya was discovered as an emerging young artist by REDSEA Gallery in 2011, when the gallery presented her first solo exhibition in Singapore. Following this first solo exhibition, REDSEA Gallery nurtured Berezovskaya’s artistic development and provided her with another platform to exhibit her works in 2013. Today, REDSEA Gallery exclusively represents Anna Berezovskaya in Singapore and internationally and has shown her works at Art Stage Singapore 2015 and Art Expo Malaysia 2014. As a result of her solo exhibitions at REDSEA Gallery, her works are highly sought after by art collectors in Russia, USA, Europe, and Asia, especially in China and Taiwan.